This is the fifth and final post in our new Head to Head series where we compare and contrast a variety of topics! Don’t miss eLearning Versus mLearning, Microsoft Word vs Google Docs vs LibreOffice, State vs Private Colleges, and Collaboration vs Competition! People learn in a multitude of ways, and elearning is a field that is extremely aware of this. Courses vary in every aspect from length to medium to degree of interactivity. One area of variation is quizzing techniques. Something every elearning course has in common is their goal: ensure content is memorable. An effective way to do this is check the learner’s memory along the way; the key technique used here is quizzing. Inline quizzes are integral to many elearning courses, but there are a wide variety of options and layouts. There are the classic multiple choice quiz with a few possible answers, or the vast array of interactive quizzing formats that utilize engaging elements like drag and drop. When it comes to elearning, typed answers are rarely an option, so it’s a battle between the two formats. One side argues interactive quizzes are always better; they’re more interesting and exciting! The other argues for the classic ease and familiar design of the multiple choice quiz. So what should you choose? Let’s compare! When used correctly, interactive quizzes are exciting; they allow for the use of sound bites, click and drags, fill-in-the-blanks, matching, and various other question answering activities. Interactive quizzes can be incredibly memorable because of the opportunity to use multiple senses. Engaging elements in these quizzes often improves interest in the subject and ultimately increases retention. The key benefit of interactive quizzes is the power to move, drag, and click elements of material. The more involved learners are in the quiz taking process, the better they remember quiz content. The ability to click and drag, draw a line between, or in some form match images between two related elements creates clearer connections in the brain and better imprints the concept in a user’s memory. In this case learners are physically (in a digital sense) interacting with the question, as well as seeing it. Throwing sound into the mix brings the total senses used up to three: sound, sight, and touch. The more senses used, the more memorable the content. 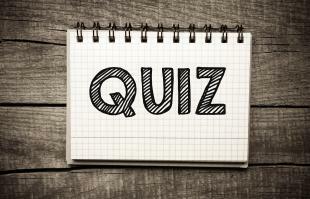 These types of quizzes are familiar to us all; we’ve been taking them since middle school. Provide a question and the user picks the answer out of a selection of four to five possible answers. It’s easy, it’s quick, and it doesn’t take long to design. You can include scenarios and case studies with text-heavy questions and lengthy answers without any risk of confusion. They even offer the opportunity to include images or video with “identify this image” or “what is happening in this video?” style questions. As always, it depends. They’re both great opportunities to test knowledge, but they have different benefits and are better utilized in different situations. If you can put your quiz into an interactive format easily and can clearly convey the purpose of the question and how learners are supposed to answer it, use an interactive format. When a question works well in a drag and drop format, take advantage of the more engaging quiz style. Drawing lines, picking up and moving content, listening to soundbites, and any other form of interaction with content will be more memorable than simply taking a multiple choice quiz. The downside of multiple choice quizzes is they’re boring and don’t always require learners to actually learn the material; by nature, interactive quizzes are not. On the other hand interactive quizzes also have a downside. More complex case study, scenario, or contextual questions work best in a multiple choice format. These questions are thought provoking by nature and are too complicated in more complex question formats. Attempting to drag and drop long answers is difficult to follow and tedious for learners. If information is more clearly portrayed in a multiple choice question, use a multiple choice quiz. In the end, you have to think like the learner. Lay out the question you want to ask and the content you want to use and look at it like a learner would. Would you understand the question in a matching format? Does drag and drop make more sense? Or is the simplicity of multiple choice the best for this question? Think of it this way. Simple question, complex format. Complex question, simple format. When designing your next elearning module, be prepared to address the question of quizzes and create an effective course.